Collected essays always pose a challenge for the reviewer who – like a mother asked to pick her favorite child – feels pressed to consider the relative value of each one. The first question to pose, however, is the merit of the basic premise of the collection, and in the case of Ephemeral Media, it is flat-out brilliant. After defining “ephemeral media” as referring both to works of short duration and to the relative brevity of their shelf-life, Paul Grainge notes that, with the proliferation of dissemination mechanisms, “the internet provides a platform where texts that might previously have been considered fleeting become more permanent and accessible by vastly increasing the opportunities for their distribution and remediation” (3). 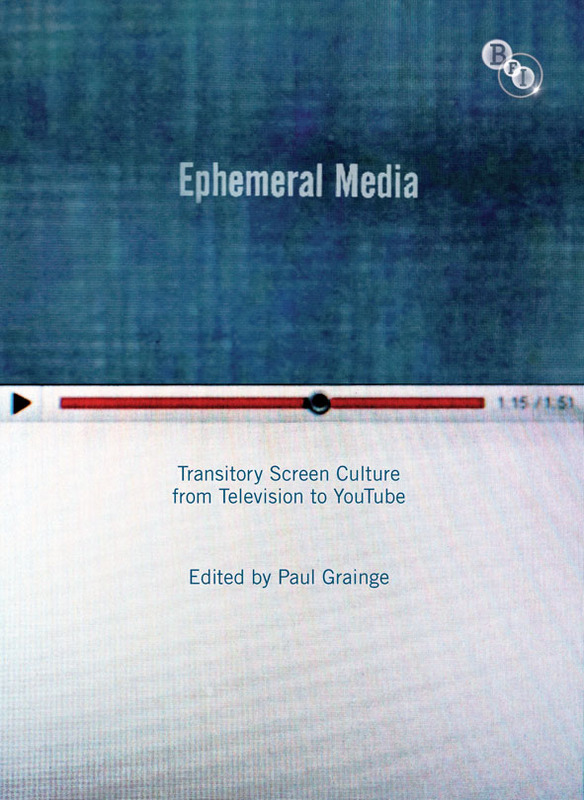 Through a stellar group of contributors, the collection focuses on the designation of ephemeral media as a “rubric to explore, and claim as significant, moving image forms which exist in relation to the more solid and substantial film and television content traditionally privileged within screen studies” (10). In other words, the essays examine what Jonathan Gray designates as “off-screen studies”, the wealth of materials generated peripherally, such as trailers (both real and fake), parodies, mash-ups, and other kinds of supplemental materials generated both within and alongside mainstream industrial production. One goal is to tease out the various ways ephemeral texts function in an “attention economy” that struggles to pick up scraps from the more culturally and economically dominant forms of media. In Part 1, “The Recurrent, the Recombinatory and the Ephemeral”, William Uricchio defines and contextualizes the ephemeral, noting the competition between networks’ attempts to control content and participatory communities’ abilities to recapture and reinvent this material. Amidst the uncertainties of technological changes, Uricchio predicts “a continued slippage between the clearly defined textual forms that we today take for granted, and an increased value for the form that we take as ephemeral” (35). Max Dawson examines a similar tension between the way “monumental” series operated and the way “networks came to rely on web videos to reinforce, redact, valorize and demystify serial narratives” in parallel texts that “nourished and sustained the boom in monumental television serials” (51) in the US from the late 1990s through 2010. An examination of interstitials and idents (channel identifiers) in Part 2 clarifies the functions and potential future uses for advertisements, as a tool to understand the orientation and assumptions inherent in high-production, repeated advertising material. John Ellis’ discussion of timing does not address recent trends that signal the influence of DVR recording and replay, in formats that sometimes deliberately blur the distinction between interstitial material and the program itself. Mark Brownrigg and Peter Meech take a similarly worshipful approach to their subject in their painstaking description of Channel 2’s idents, noting that sound functions as an important identifier for people who step away from the television between regular programs. Again, this essay is also notable for its failure to address recent silencing and condensing effects of DVR technology on interstitial material. Paul Grainge’s interview with Charlie Mawer, of Red Bee Media, provides a rich historical snapshot of the evolution of television promotion, but it also neglects some of the ramifications of digital recording technology. It does address somewhat ominously the implications of “generations that have grown up not paying for creative content online and expecting it to be free” (101). In Part 3, the Evolving Media Ecosystem, Elizabeth Jane Evans establishes how ephemeral and established content interconnect, in an interview with BBC’s Victoria Jaye, who claims that their multiplatform archiving provides “a public value that they just didn’t have on the dusty old shelf” (117). J.P. Kelly’s wittily written essay elucidates the categories of flows, files, and streams, noting that “once transferred into this [internet] space, television must assimilate with a medium characterized by ephemerality, fragmentation, brevity and temporal fluidity” (126). He goes on to analyze how Hulu adapted their ads specifically to the internet environment and how “binge viewing” of box sets differs from the ephemerality of online viewing. Jon Dovey’s highly readable and personal account of the wave of video creativity that coincides with his own development of a drama project beginning in 2007 meanders over some great intellectual real estate, including a concise survey of the literature and pithy descriptions of some of the most viral and lucrative web dramas. Elizabeth Jane Evans continues in this vein, arguing for a nuanced understanding that challenges Harold Innis’ more rigid distinction between permanent and ephemeral technologies. Her detailed analysis of KateModern’s emphasis on hyperephemerality connects this phenomenon with the staged openings of more mainstream works like Harry Potter (2001-11) or Twilight (2008-12) in integrating fans and spectators into the universe of the drama and creating the “illusion of agency” (169). The fourth part of this collection, Below: Video- and User-Generated Content, comprises three essays that look at paratexts, which include prefaces, introductions, and “the making of” DVDs, designed to “make sense of themselves, to seek legitimacy and to manage change (through self-expressions, self-narratives and collective rituals)” (John Caldwell, 175). Caldwell maps out the intricate pattern of competition that complicates the participation of “free” labor, which benefits management but undermines the position of union and professional workers. Barbara Klinger argues that the reenactment of iconic movie scenes have “mnemonic and value-laden effects” and “guarantee that texts and their moments will not be forgotten, will be sustained in some sector of the public eye, will be canonised . . . or bolstered in their existing canonic status” (206). Moreover, these performances provide further marketing venues and are also “texts in their own right capable of capable of ‘massaging’ the meaning and affect of sources in unexpected ways” (210). It is fitting that Grainge’s collection closes with Rosamund Davies’ description of her own online hypermedia work, Index of Love (2007), which gives viewers access to an array of arrangements of material, but no definitive conclusion. According to Davies, user-generated content (UGC) and its continued mediation represents what Jameson identified as the ultimate realism, in works that “constantly replay absence, even as they assert presence” (224). This paradoxical conclusion typifies a recurring theme of this collection, the notion that ephemerality itself constitutes a presence, a permanent phenomenon, inextricably bound with our aspirations toward the eternal and the timeless.